With approximately 50,000 known species of spiders crawling around the world, the task of identifying every single type that lives in Montana would be overwhelming. Certain species are quite common in Montana, however, and understanding some of their basic physical and behavioral characteristics helps to make the identification process simpler. One of only two poisonous spiders found in Montana, the black widow is generally not aggressive unless the female is protecting her eggs. 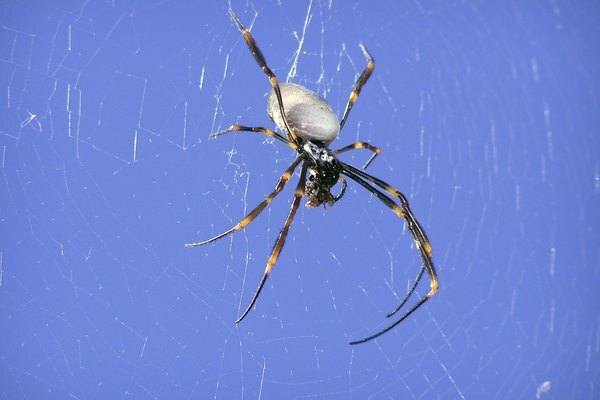 The spider's name comes from the female's unpleasant tendency to dine on the male after mating. On the underside of their abdomens is an orange or reddish hourglass marking. 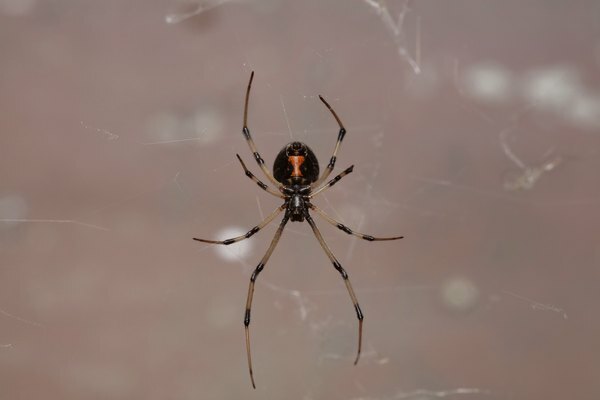 Montana is home to both the western and northern black widows. Females of the western variety have almost completely black hourglasses with a red tip, and males are light brown. Both northern males and females have hourglasses that are incomplete or split into two triangles. 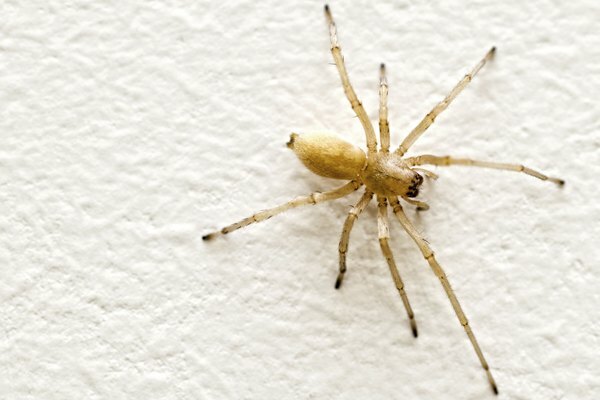 The other poisonous spider found in Montana is the aggressive house spider, also know as the hobo spider, which is usually found on the first floor or basement levels of houses. They have long legs and run very quickly. Their abdomens are yellow with a chevron (upside-down V-shaped) pattern, and their legs are brown without any pattern, banding or stripes. They bite when they feel threatened. Although poisonous, they are also useful for treating necrotic spider bites (bites which cause tissue to die). 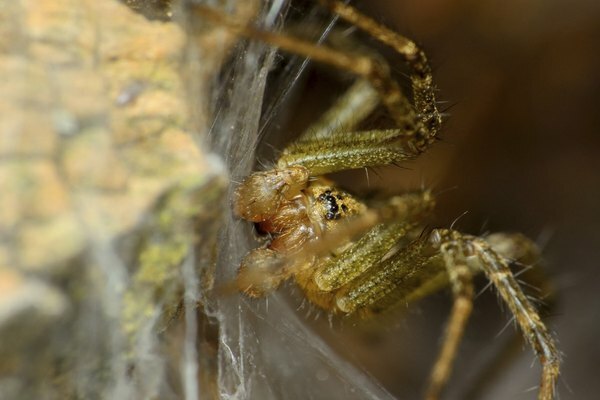 This species is rapidly becoming one of the most common spiders in the Northwest. Named for their similarities to wolves, wolf spiders are medium to large in size, brown or black and hairy. These spiders also have long legs and can get around quite speedily. Their eyesight is excellent, and they use it to hunt down prey. Wolf spiders are among the largest spiders found in Montana and can be aggressive. Wolf spiders do not spin webs. In autumn, if they cannot find food, they will often move into houses. The female carries the eggs in her spinnerets until they hatch, and after they emerge she carries the baby spiders on her back. Common in the late summer and fall, orb-weavers are large at 1/2 to 1 inch long. Their markings are generally black, white, orange and/or yellow. Their webs are quite large yet take less than an hour to build. The orb-weavers construct a central hub and then weave spokes radiating out from that point. The female sits in the hub waiting for movement, which lets her know that prey has been captured in the web. Female orb-weavers also produce a great number of eggs at a time, ranging from 300 to 800.